Liam grew up in central Victoria, before moving to Melbourne to commence his tertiary study. He obtained a Bachelor of Human Movement at Deakin University and also completed a Certificate in Therapeutic Massage during this time. 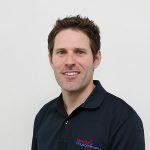 With a mother and sister as physiotherapists, he decided to follow the ‘family tradition’, and moved to Albury in 2003 to study Physiotherapy at Charles Sturt University. After seven years of study, Liam commenced work at Flex Out Physiotherapy in 2007, and then went on to become a director in 2013. As an A grade cricketer for many years, Liam had ongoing issues with his shoulder, and this led to him developing a special interest in managing shoulder pain and movement dysfunction. He also spends a lot of his time in the field of occupational health physiotherapy, where he has a passion for developing strategies to prevent injuries in the workplace. He currently is a workplace health consultant with MARS Petcare in Wodonga, and Riverina Dairy in Albury. Outside of work, he spends a lot of his spare time in summer out on the lake waterskiing, and enjoys riding his mountain bike. He is also a keen snowboarder in the winter months.